How to create QR code with a picture - Fast Reports Inc. It's no longer a novelty to see a pixel QR barcode on the product packaging. Although it is more complicated than a regular bar code with stripes and it is undoubtedly more reliable. The technology of QR codes contains redundancy (duplication of information) and a checksum. Therefore, even with 30 percent code corruption, it can be read. And the checksum ensures that it is read correctly. This code safety margin allows you to read it to various mobile devices, with low resolution cameras or in low light (falling shadows). Due to the fact that the resolution of modern cameras on mobile devices is quite high, the redundancy of the code is no longer so relevant, so the placement of the image inside the code has become fashionable. Typically, this is a company logo. But it may be a small text. For example, the URL of the site, encoded in this code. This will let you know the contents of the code, without a scanner (smartphone). Typically, images or text are placed in the center of the code, to emphasize attention. A QR code decorated with a logo is perceived quite differently. He draws attention. The picture is not included in the code, it is superimposed on top after the formation. The main condition - the image can overlap up to 30% of the code, no more. FastReport.Net has a wide range of barcodes. Of course, among them there is a QR code. Let's take an example. 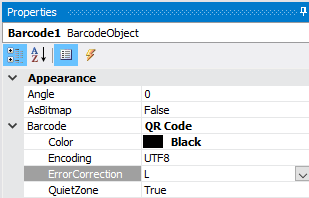 Create an empty report and add a Barcode component of the QR Code type to the report page. 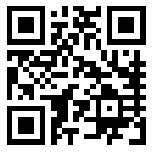 Let's try to read this code scanner on your smartphone. Nothing comes out. But why, because the image does not overlap the code by more than 30%? The point is that the QR code has an error correction setting - this is the degree of code redundancy. By default, it is set to the minimum value. And it also works without any problems. Although the branding of QR codes deteriorates the resistance to damage, this trend is gaining more and more popularity. After all, it is stylish and attractive. 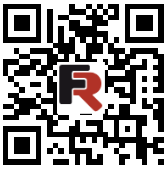 For more information about using a QR code in FastReport.Net, you can get to the article: https://www.fast-report.com/en/blog/103/show/.